Alright "Tooth and nail" was a very good album and Dokken had some other good songs. However Lynch was often more flash than substance. He was one of many guys in the 80's who got labeled a "guitar god" just because of a few solos. I have never understood his appeal. The first two Ozzy albums he played on were good, but the rest of the Ozzy albums and most of BLS stuff is crap that plenty of guitarists could have played. He has spent the past two decades riding more on hype and image than on actual contributions. He plays lots of notes and he taught Steve Vai and others who went on to better things. However, he is a boring writer and much of his material is cold and lacks emotion. Pantera along with Metallica did keep metal in the eyes of the mainstream during the 1990's. However that was Pantera as a unit and no one in the band was any kind of standout. No disrepect, but Darrell was playing very simple riffs without adding any great tone or feeling to them. Some were good and some were very mediocre, but he certainly never made the kind of contribution to earn him the guitar legend status that has been given to him. Okay, Mamlsteen's playing helped that Steeler album to be above average plus the first Rising Force album was decent and Odyssey was good. However he spent far too much his 25 plus year career playing the same material and thriving on being self-indulgent. I hear a few seconds of much his material and I am like "ho-hum". He can play fast, but it's often over the top and even lifeless at times. While other guys like Steve Vai make the guitar look fun, Malmsteen is still striking poses and trying to ride on the label of being a guitar virtuoso. 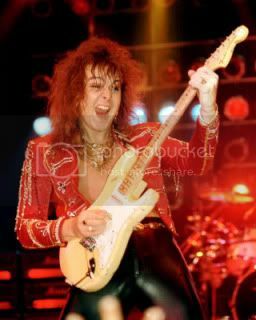 Yngwie "did a lot for the guitar and no one has topped him since. Amazing player." Whether you like his wanking or not, you refuse to give credit where credit is due. The guy created a new genre of guitar playing, that along with your hero Hendrix, people have been trying to emulate ever since. Yngwie has had a couple of good albums, I said that already. Way overrated though. He is so big on self-indulgent playing and his growth as a player over the years has been minimal. I can't think of anyone else who can try to play so much, but still be so stale. No one gets points for influencing people to make terrible music. Yngwie is a wanker's wanker. Terrible stuff. He's a joke and so are his followers. His playing is entirely emotionless. This list is great. The only change I'd make would be to move Satriani up to #1. Yngwie is a total wanker, but compared to Satriani it might almost seem like he has some soul. Trying to equate the influence of Hendrix to the influence of Yngwie is like trying to equate the influence of Gandhi to the influence of Hitler. Sure, people are still inspired by both, but wouldn't it be better if no one had ever been influenced by the latter (in both pairs)? 5 Allison Robertson "the Donnas"
I dont think that YNGWIE MALMSTEEN is overrated only didnt release any good album in years. Sad but true. You need to go to a hearing specialist because you obviously cant hear anything in those 2 holes. To call any of those guys overrated is just plain stupid. whether you like or dislike their music these guys are "real musicians" that are exceptional on the guitar. Does it make it good music...Thats just your preference. anonymous-Let's see no one is overrated because they are real musicians. These guys are overrated because they have gotten a lot of hype and recognition that they have not earned because either their music blows or they have not done anything worthwhile in some time. Being overrated does tie in with one's view of their music. anonymous-I will assume that you mean that you are jealous of me for composing such an accucrate list. If so then thank you. You couldn't possibly be defending any of these guys. Akira Takasaki is extremely underrated and even unheard of. Anonymous-I think Takasaki is slightly underrated. Although my problem is that after the mid-80's Loudness have been very hit and miss. OP should whole-heartedly agree with Hendrix being overrated since 1: He plays things much easier than Zakk Wylde, and 2: As precedented with Yngwie, there are no points for being influential here. Yeah Yngwie, while quite skilled is pretty boring and soulless. He played scales real fast. My quick one: Definitely Kirk Hammett way over-rated than Dime--and lemme say while it's opinion, as someone who's been playing guitar since '73 (oh dear...), I kinda have a little insight on this. Putting this out there: I truly don't hear any guitarist, locally/regionally or internationally, having any lineage to Kirk. No one seems to have any influence or love for the guy's style, even though he graces the cover of whatever guitar player magazine needs to sell some more advertising space. Dime's influence, on the other hand, still continues. 13 years after his entrance into "the harmony", and over a quarter century since "Vulgar", you STILL hear guitarists imitating Dime's lead style, writing songs influenced by Dime, and trying in vain to get a tone like Dime's. (Lamb Of God made a killer career out it.) In these terms, many other players fall way short and deserve an over-rated status. Dime is (was?) one artist who would be better replaced on this chart by, yeah, Kirk. Anyway guys, thanks for your continuing support throughout the years. Hope to meet you all at one point. S.A. Thanks S.A. for stopping by and adding to our comments. While I tend to agree with Metal Mark about his five over-rated players, Kirk Hammett could slide in there at six. As much as I love those early albums by Metallica, Kirk's playing is good but not exceptional. Mostly it just fits the style. As for Dime? Honestly, I have a love/hate relationship with him and Pantera. Sometimes I think that his playing was too influential...especially when I am reviewing yet another band that obviously loved "Cowboys From Hell"! @ S.A. Adams-Thanks for sharing your opinion and for giving some reasons. I think Hammett is overrated to an extent. I think he came in at a time when Mustaine and Hetfield had written a lot of what was on Kill 'em all and after that my guess is Hetfield wrote most of the good parts of the next two albums. I think Hammett did more filling over the years then he ever did creating memorable guitar parts. However I never heard too many people call him a guitar god. I heard plenty of people praise Dimebag and I think his material was so basic. I think he did all he could by Cowboys and everything beyond that not so creative versions of what he had already done. I don't agree that he was good just because he influence other players. I don't like Yngwie either, but he influenced people too. Again thanks for stopping by and adding your view.